Roomba is among the most successful consumer robots ever made, having sold well over 2 million units. And iRobot's newly released 500 series is the first major revamp of the floorvac line since 2004. Nearly everything about the bot has been changed or improved; it's stronger, quieter, smarter and will last five times longer than its predecessor. A full report on the Roomba 560's anti-tangling technology, voice module, and RF "Virtual Wall Lighthouses" is just after the jump. The creators of the Roomba, iRobot Corp. of Burlington, MA., have been plenty busy of late. Along with providing the military with IED-disrupting Packbots, the company released the Verro pool cleaning robot in April, the Scooba mop-bot last November, and the programmable Create at CES in January, 2007. The Discovery line, which is the third generation, came out in 2004, and the Discovery with scheduling capabilities, which is the fourth generation, came out shortly after. But aside from some feature adds and lower end models, iRobot hasn't supplied any real improvements to its vacuuming robots in more than two years. As with earlier models of Roomba, the 500 series rolls around the house sensing dirt and vacuuming the floor for about 45 minutes per room. Using an array of sensors, it pokes into every corner and cranny eating up dirt. One of the most significant changes is that the Roomba now has an array of IR sensors running along the front bumper. Previous versions of Roomba noisily banged into walls and furniture at full speed. 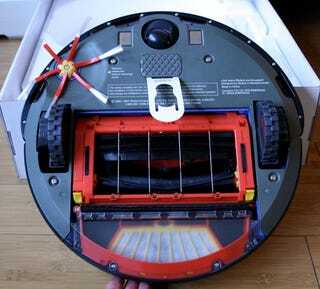 But the sensor array, along with optimized software, helps the Roomba to slow down a bit before impact. This collision detection feature makes running the floorvac while writing a review of it much less distracting than in the past, although the folks at iRobot say they have always been surprised by the number of people who sit around watching the Roomba run rather than just leaving the house. Roomba owners interact with the bots in all kinds of counter-intuitive ways, and I'm not even talking about the people who dress them up in French maid costumes. But that's part of why iRobot decided to re-think and user test every single detail for the 500 series. They even experimented with different shapes and dimensions (they stuck with round, obviously). The interface buttons have changed, there used to be four and they were not terribly intuitive. Now there is a big "Clean" button and another one that says "Dock" and that's about all you need to know to operate this robot. And in case that's not enough, iRobot has built a vocal tutorial into the unit. The voice module also alerts you if it gets broken. The brushes on the underside were re-designed to shoot larger chunks of debris into the bin. And the suspension on the wheels was improved to give Roomba greater mobility over thresholds (it surmounted the 1/2-inch rise between my kitchen and dining room with ease). And yes, Roomba now works on big thick carpets too. The old Roomba was no match for electric cords or the tassled fringes on most rugs. This was a fatal problem, because it required you to Roomba-proof the house before cleaning. The 500 series finally overcomes the tangle problem by stalling the brushes momentarily whenever a tassle is encountered, then moving away. This feature is not perfect, - smaller cords, like the power cords for cellphones, will probably still get munched by Roomba. But it worked for every other type of cord it encountered in my house. As before, some Roomba models come with "Virtual Walls" that confine Roomba to a single room. The 560 ships with a pair of vastly improved "Virtual Wall Lighthouse" barriers. Unlike the old walls, which used IR to communicate with Roomba, the Lighthouses use three IR beams and RF to allow for a systematic room-to-room cleaning. As the Roomba begins cleaning the kitchen, for example, the LIghthouse acts as a barrier. When the Roomba has finished cleaning the kitchen, it sends a signal to the lighthouse, which will then instruct Roomba to pass into the next room and continue its cleaning. This worked perfectly in my tests, as the Roomba scooted under the dining room table but never lost track of the Lighthouse. And then, after about 30 minutes in the living room, crossed the barrier and began cleaning the kitchen. The Lighthouses, it turns out, also help Roomba to understand how large a room is, thus making it more efficient. Roomba's larger internal capacity has another benefit which I've saved for the end because it's so interesting. The bottom of the 500 series has been overhauled, and made modular. Unscrewing the bottom cover reveals that every component of the new Roomba is modular and user-replaceable. If the caster wheel goes bad, just pop it out, get a new one and pop it back in. iRobot claims that this, along with better seals that keep out grit, will extend the life of the floorvac five-fold. This is more important than it appears, because Roomba owners vacuum a lot more than expected - three or four times per week, as it turns out. The 500 series is tested to withstand 4 runs per week and last three-to-five years. The modular components also make the Roomba even more hack-able than before. iRobot even acknowledges as much on the packaging of the 560 itself - a sticker appears on the wrapping around the Roomba that reads in part: "For software programmers interested in giving Roomba new functionality we encourage you to do so." One last thing, just as in earlier models the designer have hidden some easter eggs in the Roomba. Let the hunt begin. There are 3 models in the 500 series, which goes on sale today. The 510 is the most basic model, it does not have a docking station, and sells for $250. The 530 includes a home base for the Roomba to automatically dock with, and the old style virtual walls, for $299. The 560 includes the dock and the Virtual Wall Lighthouses for $349.